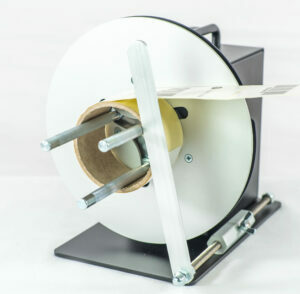 The MC-11+ handles labels up to 115 mm wide and will wind a roll of labels up to a 220 mm diameter. This unit includes an Ajustable Core Holder (ACH) that accepts any core size from 25mm to 101mm. The new build-in potentiometer allows to control the amount of rewind speed/torque. No awkward, troublesome belts or clutches are used and no speed adjustments are required. The Mini-Cat has an inner label flange to keep the edge of the label web aligned as the labels are being rewound. The MC-11+ is complete and reliable thanks to its external control. It enables the printer to control the rewinder, activating it only when printing or feeding forward.